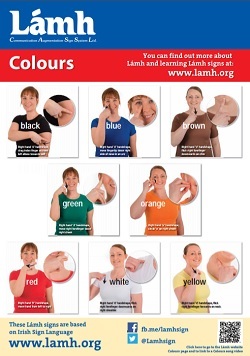 The Colours poster is an A2 size poster with Lámh signs for Colours. It shows photos of how to make the Lámh signs. 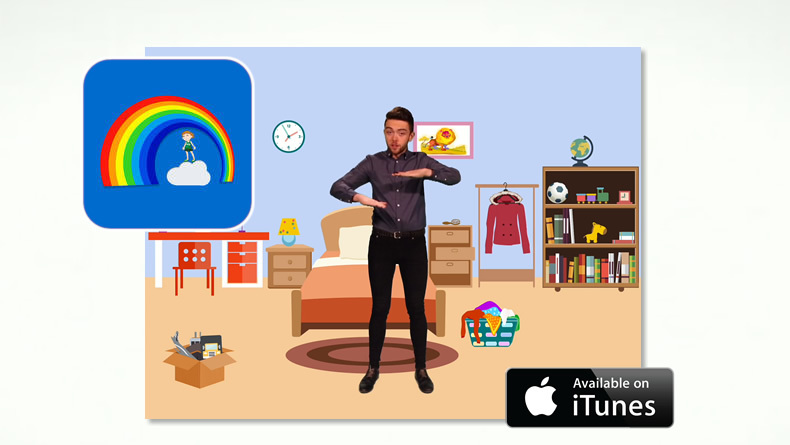 The poster is particularly useful for classrooms and pre-schools. Post & Packaging is €3 for one poster; €5 for 3-5 posters and €8 for more than five posters. 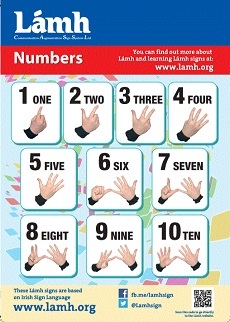 The Numbers poster is an A2 size poster with Lámh signs for Numbers 1-10. It shows photos of how to make the Lámh signs from 1 to 10, with words and numbers. The poster is particularly useful for classrooms and pre-schools. Post & Packaging is €3 for one poster; €5 for 3-5 posters and €8 for more than five posters. 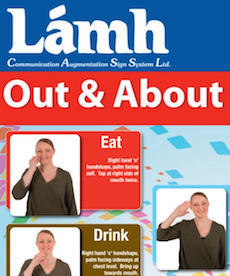 The Out and About poster is an A2 size poster with Lámh signs that might be used when Lámh users are out and about, e.g. going to a Café. 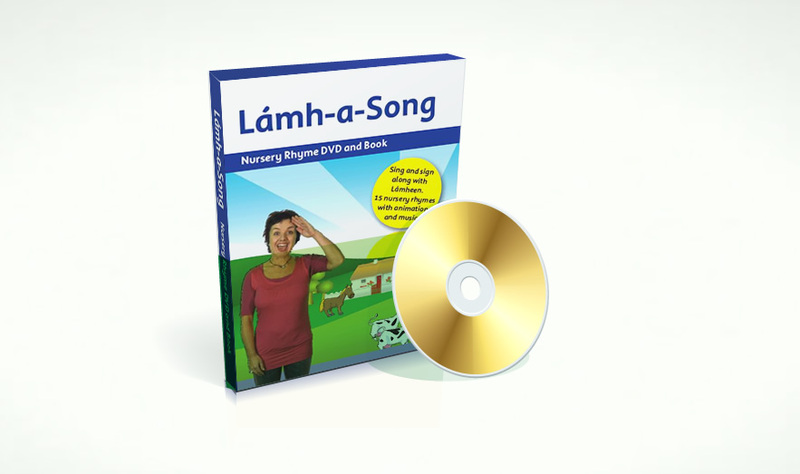 It shows photos and descriptions of how to make the Lámh signs - eat, drink, hello, help, thank you, milk, sandwich, more, good, toilet, money, more. The poster could be useful for children and for adults, for anyone who is out and about in their own community. Post & Packaging is €3 for one poster; €5 for 3-5 posters and €8 for more than five posters. 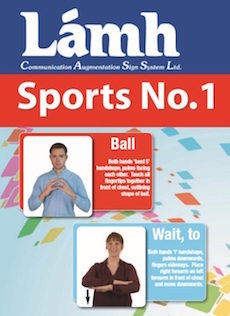 The Sports poster is an A2 size poster with Lámh signs that can be used for sports activities. Many thanks to Dublin Gaelic Footballer Dean Rock for taking part in our photoshoot! It shows photos of how to make the Lámh signs for Kick, Play, Ball, Finish, Stop, Help, Wait, Good and a brand new sign for Match! with a description of each. A second Sports Poster will follow. Post & Packaging is €3 for one poster; €5 for 3-5 posters and €8 for more than five posters. 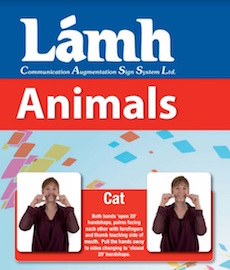 The Animals poster is an A2 size poster with Lámh signs for Animals. It shows photos of how to make the Lámh signs for Cat, Dog, Cow, Fish, Sheep, Pig and Rabbit with a description of each. The poster is particularly useful for classrooms and pre-schools.